One of my favourite things to make at home, but that I rarely get the chance to, is bread. There is something so satisfactory about making your own bread I really wish I did it more. 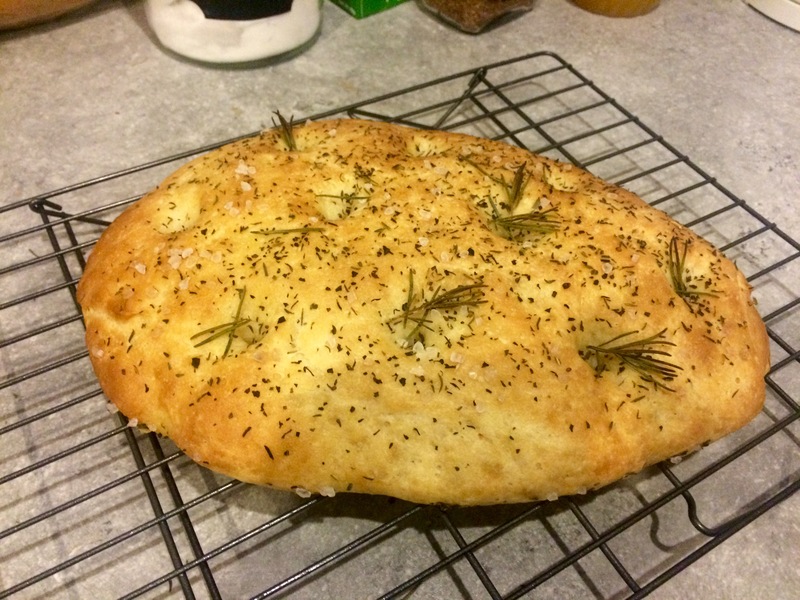 This weekend I sat down and flicked through a few Paul Hollywood books for inspiration and, after considering making a basic white or wholemeal loaf to use for sandwiches, I eventually chose to make a focaccia as its something I’ve not done before. Focaccia is an Italian bread often enriched with rock salt and herbs. You’ll probably be most familiar with it being served in Italian restaurants before your starters arrive with oil and balsamic vinegar for dipping. It’s a pretty simple bread to make as the dough is quite plain and the herby flavours come from the toppings as opposed to it being incorporated in the dough. It’s ideal for serving to dinner guests alongside starters, or we shared a loaf with our Saturday night dinner of chicken and rice in an orange sauce, to mop up the extra juices. I sort of followed a Paul Hollywood recipe from How to Bake but ignored the instructions about shaping as I was looking to go a bit more rustic (also because I didn’t have a square tub for proving) and I also went with my own choice of flavourings on top. I do have a habit of sort of using recipes, but then basically doing it my own way. This recipe makes two loaves so if you want to halve it, feel free. If you are used to making bread, expect this dough to feel a little wetter than usual as it’s quite heavy on the olive oil (which contributes to the final flavour). I used fresh rosemary and dried thyme to flavour my loaves but feel free to mix it up and use what you have on hand. If you have an oregano plant on your kitchen windowsill, by all means use fresh oregano instead. Simply using dried herbs would also suffice. Next time I use this recipe I may even experiment with using some spices as well. 1. In a large mixing bowl add the flour, salt to one side and yeast on the other. Create a well in the middle. Add 40ml oil and 3/4 of the water to the well. Use your hands to mix together. 2. Continue to add water a little at a time until all of the flour has come into the dough. 3. Keep mixing with your fingers until a wet dough is formed and tip out onto a lightly oiled surface. 4. Knead for 5-10 minutes. Do not dust your surface with flour, the dough should remain quite wet. 5. Place the dough in an oiled bowl, cover with cling film and leave to prove in a warm place (airing cupboards are ideal) until doubled in size. 6. Line two baking trays with greaseproof paper and a very light drizzle of oil. 7. When the dough has risen, tip out onto the oiled work surface and divide into two. 8. Gently, taking care not to knock out too much air, flatten each piece out into a rough oval. Don’t focus on the shape too much, the rustic look suits this bread. 9. Cover each tray with cling film and pop back into the airing cupboard (or your chosen warm, dry place) for another hour until each loaf has doubled in size. 10. When the dough has doubled preheat the oven to 220ºC while you prep the loaves. 11. Use your fingers to make dimples in the dough and scatter over sprigs of the rosemary, stuffing some into the dimples. Generously sprinkle with dried oregano and salt. Drizzle with a little oil. 12. Bake for 15 minutes or until cooked through. 13. Remove from the oven and leave to cool on a wire rack. I absolutely loveeeee homemade focaccia! !